Our summer Bronze Camp will from the 6th-12th Jan. This year we won't have a building so live in accommodation will not be available. All families with someone eligible to do their Bronze/SRC this season have been sent an email with an expression of interest form to fill. Members are asked to make the necessary arrangements for accommodation as required. 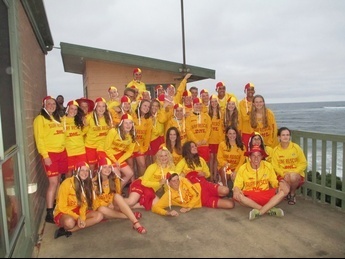 Bronze camp is an opportunity for new and old members to gain their Surf Rescue Certificate or Bronze Medallion which allows holders to become Life Savers on beaches throughout Australia. During Bronze Camp participants learn a variety of surf, first aid, resuscitation & rescue skills. Working out of containers this season it will be different but the program will be going ahead. 13+ for the Surf Rescue Certificate and be able to swim 200m in 5 minutes in a pool. 15+ for the Bronze Medallion and be able to swim 400m in 9 minutes in a pool. The Bronze medallion is a live in camp, where candidates will participate in training all day and sleep in the club bunk rooms at night. It is not a requirement to stay at the club but most Bronzies enjoy staying at the clubhouse as it’s a good chance to get to know other members of the club. SRC’s are usually younger and only are required from 9am til 6pm each day. They are requested to stay at home unless there are other circumstances that make it more convenient for them to stay at the club. This season we are also including the Advanced resuscitation award for the Bronze candidates. Dates: 6th – 12th of January 2018. Meals: Lunch for all candidates will be provided along with Morning & Afternoon Tea. Dinner will also be provided to the Bronze Medallion holders (Sunday dinner till Saturday lunch). Note: Dietary requirements can be catered for, please include details in enrolment form. Camp Program: The final program is currently under construction. Stay tuned for more details, but please see below for a basic breakdown. On Sunday the 6th will we start with enrolment checks, a welcome chat with parents and candidates, introductions of instructors and key committee members, a tour of the clubhouse and get to know you games. On Monday the candidates will complete the timed pool swim, we ask parents to be available to ferry kids to the Wonthaggi pool at 10am. Big Wednesday - on the Wednesday of the camp we ask parents to join us at the clubhouse for a BBQ dinner to catch up with the candidates and participate in some fun beach activities. Saturday 12th - Assessment day, outside assessors from Lifesaving Victoria will come and assess the candidates theoretical and practical knowledge. Saturday night from 6.30pm is the Bronzelow Presentation Evening where candidates will receive their patrol uniforms, certificates and reflect on the week. Once the Chief Instructors have received your completed enrolment forms they will get back to you ASAP confirming your place on the camp. **If you wish to pay by cash or cheque on the Sunday 6th Jan 2019, please make a note in the enrolment form.